If you are a repeat customer with a valid email address in our database, you can now schedule your own sealing project (Max 4 weeks in advance). Your parking lot is a significant investment in your property and one of the first impressions your business makes on your customers. Well maintained parking areas project a positive image to arriving customers. The punishment from daily traffic, chemicals such as gasoline and oil, the sun’s UV rays, and water all contribute to the deterioration of asphalt. Don’t let a neglected parking lot be the first thing your customers see. Most asphalt driveways in our area last 15-20 years. 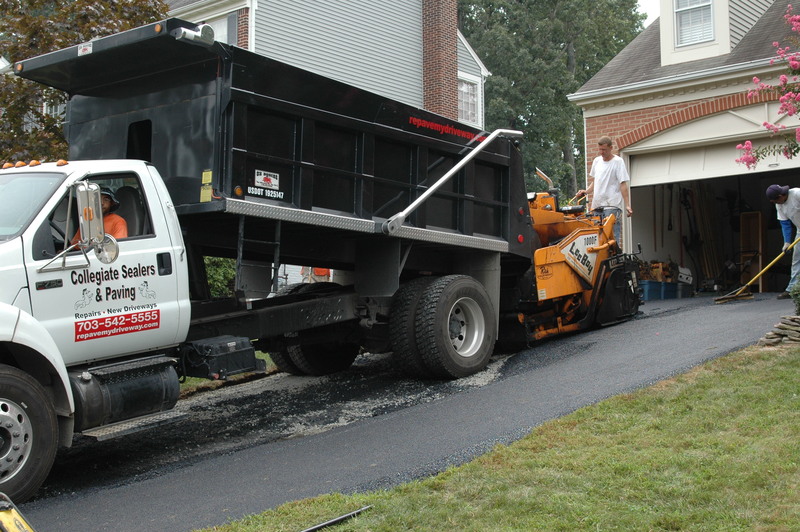 When areas of the driveway are beyond sealing or if it’s time for a new driveway, contact us for a free estimate on asphalt paving work. 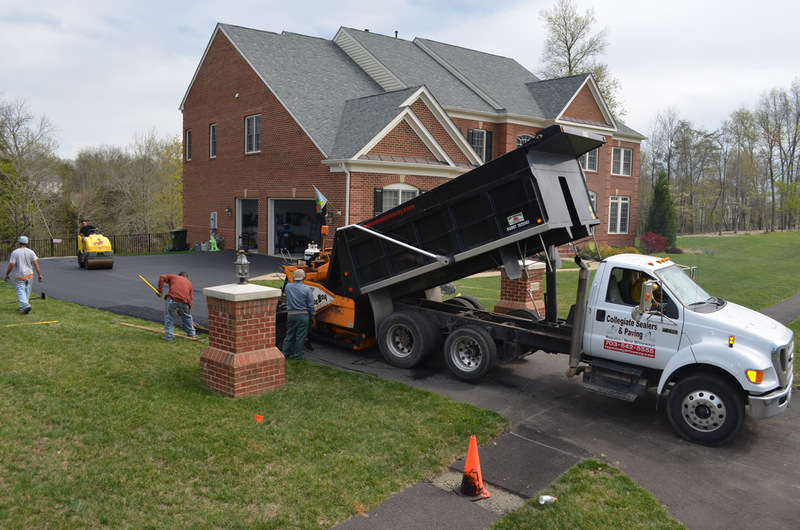 Collegiate Sealers & Paving has been servicing driveways and parking lots in Northern Virginia since 1988. We have been recognized for the third consecutive year as one of the nation’s Top 75 Pavement Contractors. Our philosophy has not changed since company owner, Rich Cornicello, founded the company almost 30 years ago while attending James Madison University. Give the best possible service at a reasonable price and the customer will not only call you back, they will likely recommend your services to friends & associates. It seems to be working as we have completed over 250,000 jobs and in many neighborhoods we have sealcoated, repaired, or replaced 75% of the driveways at least once. We take pride in our reputation as a company you can depend on. If you’re looking for a reliable, honest contractor to work on your driveway or parking lot, please give us a call. 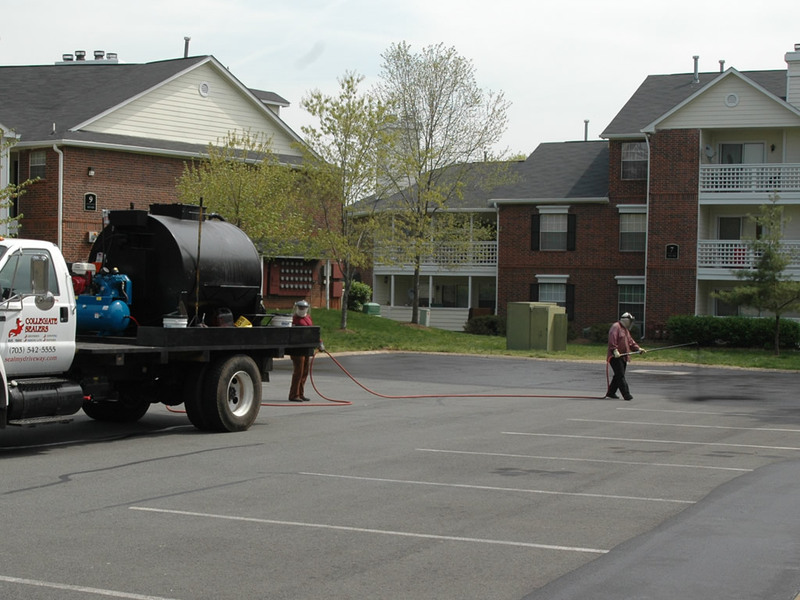 From the initial call to the completion of the project, see why over 75,000 homeowners and more than 1,000 commercial clients call Collegiate Sealers & Paving their asphalt contractor. Sealcoating restores the rich black surface of the driveway while acting as a shield protecting your asphalt driveway against damage caused by oxidation from by the sun’s UV rays, gasoline, oil, and chemical spills, moisture penetration, and winter’s freeze/thaw cycles. 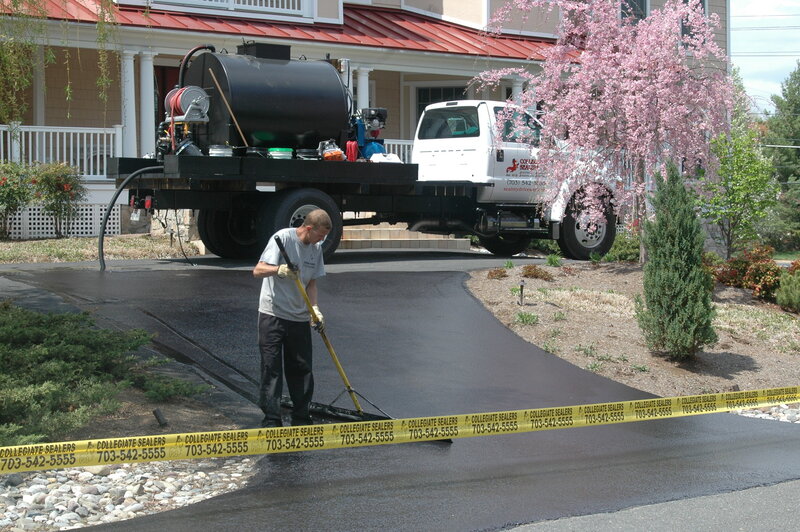 We recommend sealing your driveway no more than once every 2 to 3 years. Driveways that are extensively deteriorated usually require a complete removal and replacement. On smaller driveways, this is often the most cost effective option when compared to repair. Sometimes referred to as resurfacing. This involves placing a new layer of asphalt over the existing driveway & can be an economical alternative to a remove and replace. Not all driveways are candidates for an overlay, particularly those with severe widespread deterioration. 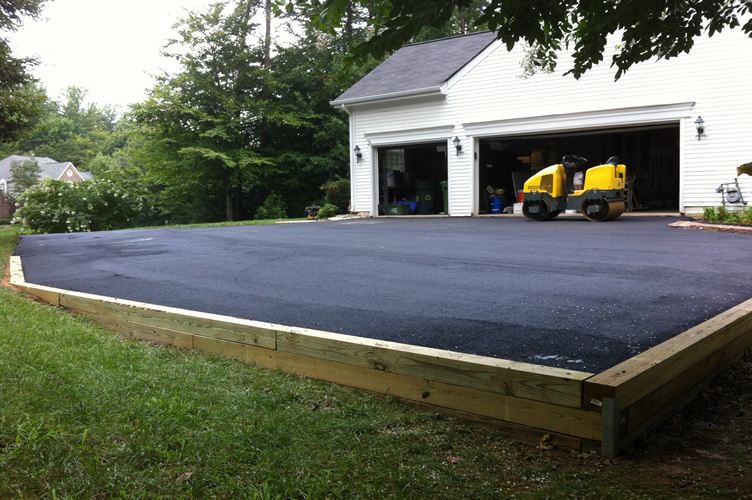 Repair is performed to correct isolated problems with the driveway. 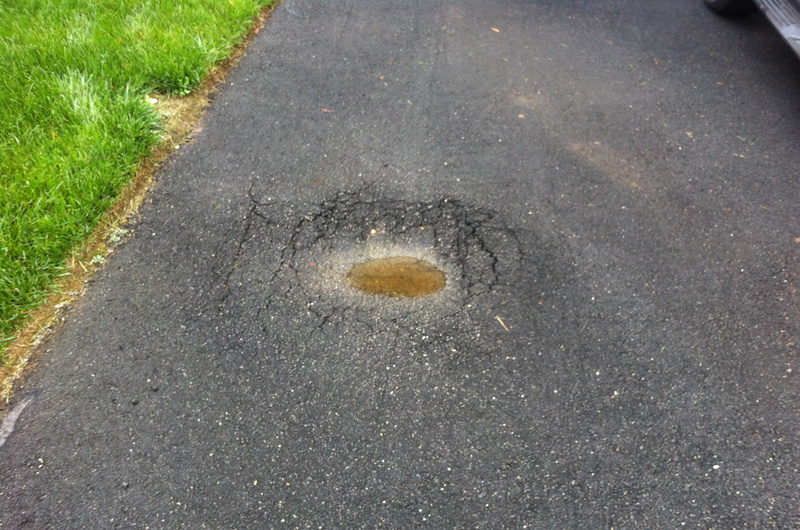 Potholes, low spots, sinking at the garage, spider-web cracking are all candidates for repair. If your current driveway is too narrow or if you need more parking space we can enlarge your existing driveway. 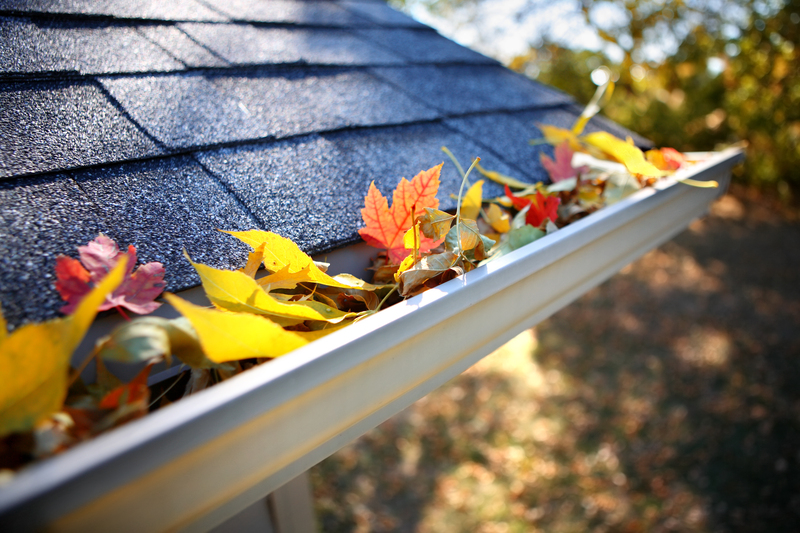 Gutters are designed to funnel water off of the roof and away from your home. Clogged gutters can cause leaks, damage to the foundation, and basement flooding. To avoid these problems, gutters in our area should be cleaned twice a year (spring & fall) to remove leaves, sticks, and other debris. Full depth patching (up to a depth of 4 inches) consists of removing the existing pavement and base material within the areas marked on the pavement. All cuts in the existing pavement are to be straight and vertical and the sub-grade shall be smooth and re-compacted as required to achieve maximum density. 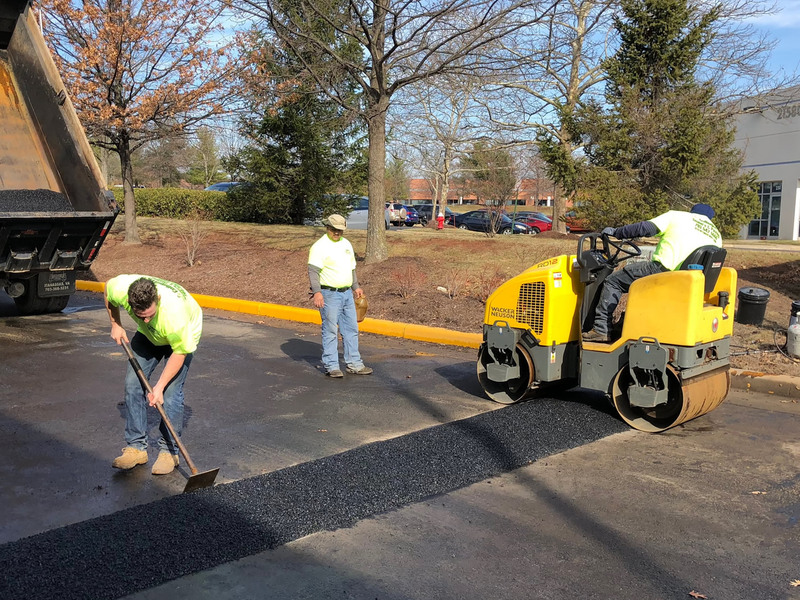 A tack coat is applied to all vertical edges of the repair using CRS2 emulsion, then new VDOT approved hot mix asphalt is installed and properly compacted for a uniform finish. Crack sealing is your best defense against pavement deterioration and consists of cleaning and sealing cracks in the pavement to minimize the penetration of water and the intrusion of debris. Work will include cleaning the cracks with forced air, heat lance, or other hand tools as required to remove debris and vegetation. After cleaning, the cracks are sealed with a rubberized crack sealant. Sealcoating provides a protective barrier against damage caused by moisture penetration, chemical spills such as oil and other automotive fluids, oxidation from the sun’s UV rays, winter’s freeze/thaw cycle. Sealcoating also renews the rich black surface of the asphalt projecting a positive image of your company. The color contrast of a newly striped parking lot is both attractive and an indication that the property owner emphasizes maintenance and safety. 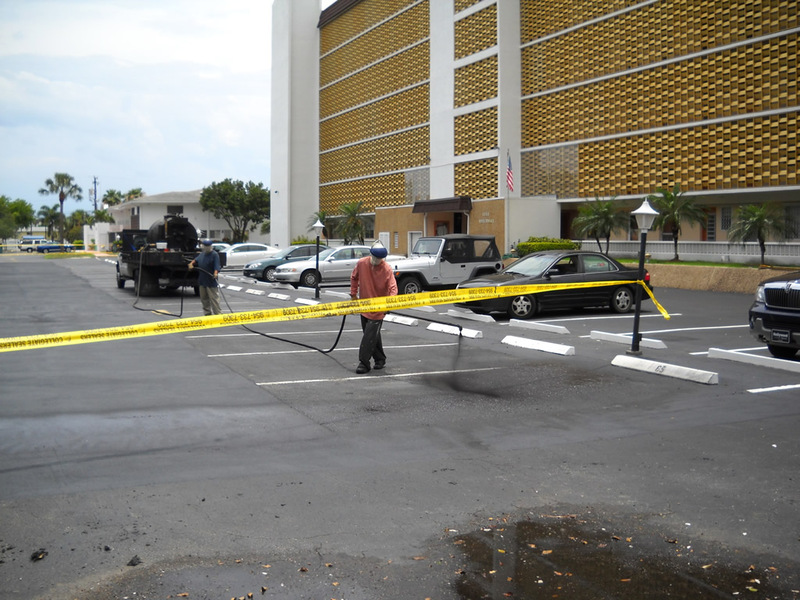 Parking lot striping wears away over time due to exposure to weather conditions and traffic volume. Restriping is a relatively low-cost service that can drastically improve curb appeal. When there is a need for traffic calming in parking lots or on private roads, strategically placed speed bumps may be the solution. Copyright © Collegiate Sealers 2018. All rights reserved.